Settle in and get your Pinning fingers ready, people! 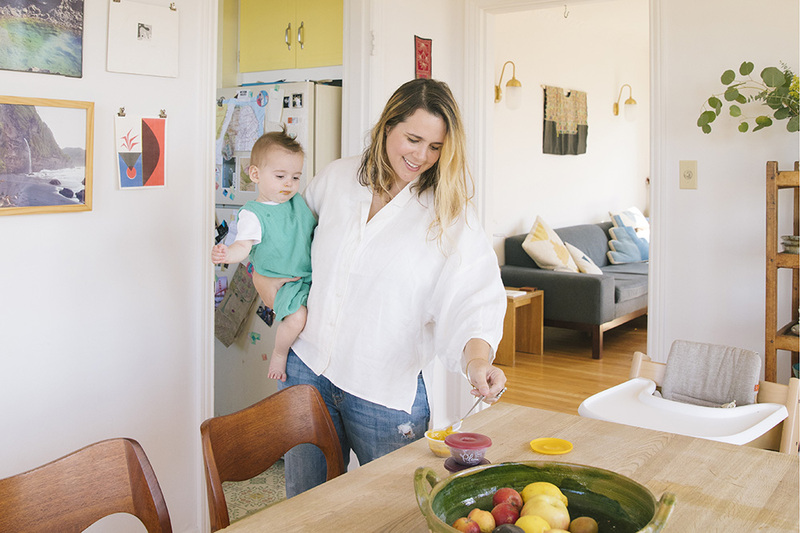 This vibrant Mother Story with new mama Dana Haim has been nearly a year in the making. 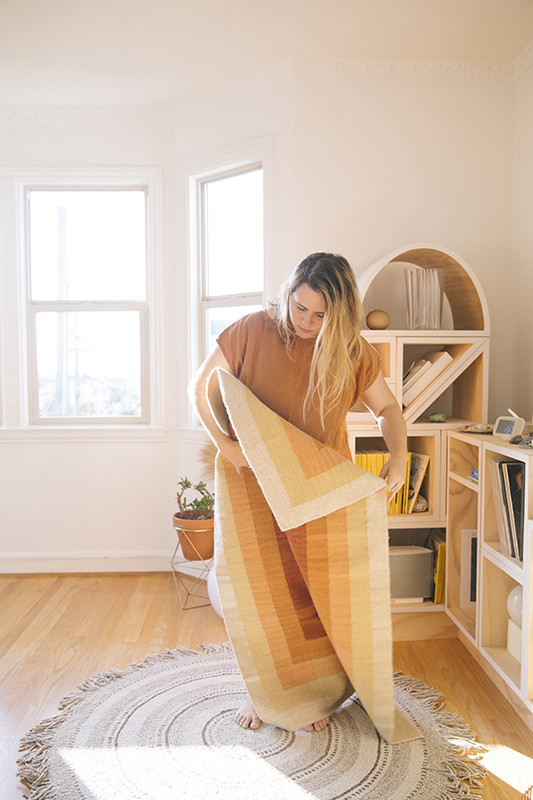 We first met the talented textile designer just days after she gave birth to her first child, baby boy Orion, which was just a few months after she made a cross-country move from Brooklyn to a light-soaked apartment in San Francisco. 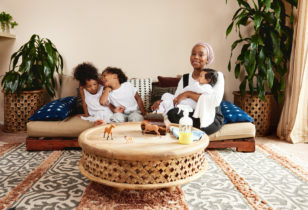 While Dana took the last several months to recover from a rollercoaster birth, ease into motherhood, and spruce up her place, we waited eagerly until she and her baby boy were ready for their close-up. 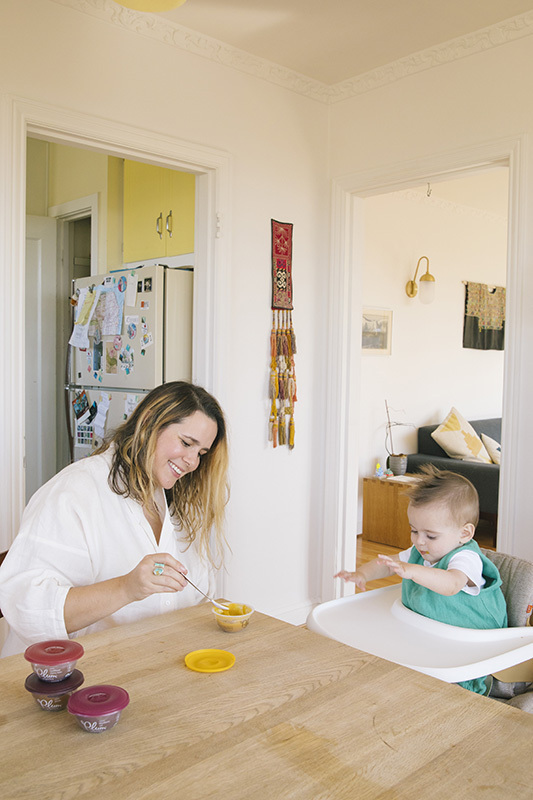 Turns out this timing overlapped with Orion’s transition to solids, which made the pair the perfect duo to take the new Plum Organics® Baby Bowls on a spin during our shoot. 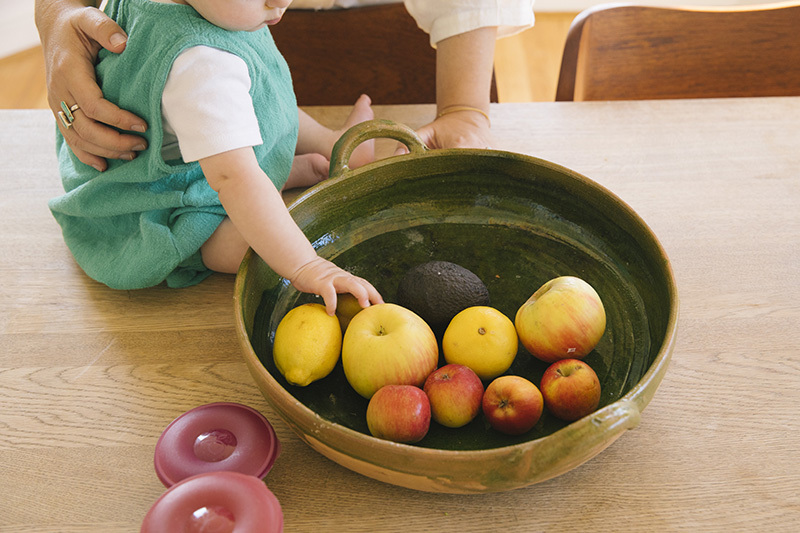 An easy and modern solution for spoon-feeding, the eco-friendly Bowls come in a variety of culinary flavors featuring organic fruit and veggie purees, perfect for the 4-months-and-up set. Watch as we dish them out—and so much more—below! 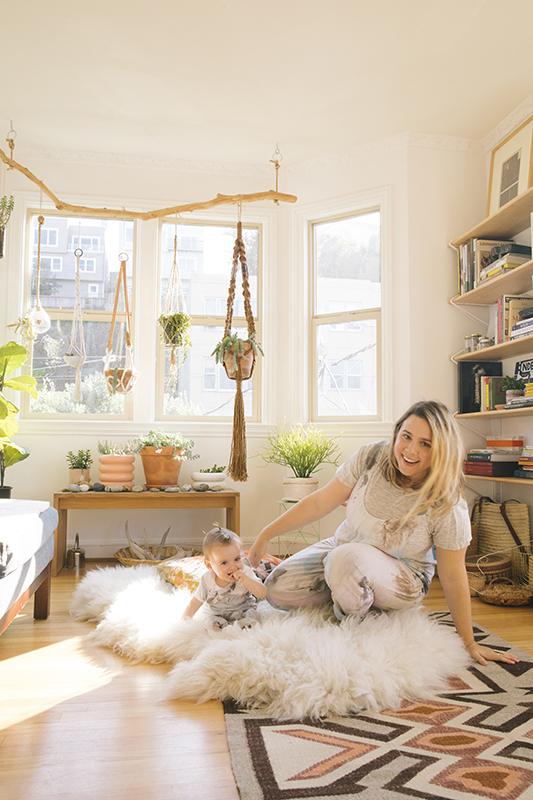 "We moved to San Francisco from Brooklyn a little over a year ago when I was seven months pregnant. We made a few trips out here beforehand and apartment hunted in a very short time to make it happen quickly. We covered a lot of ground and got lucky to find this place on Craigslist and we knew from the moment we walked in and saw the Pacific Ocean that this was our spot. There was a lot of work to be done though, every room was painted a different color, the light fixtures were dated and flickering. 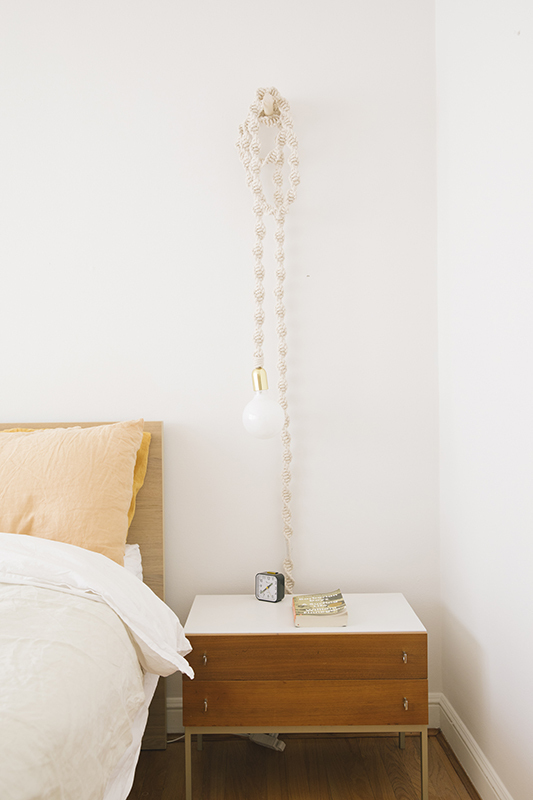 A fresh coat of white paint and new lights made all the difference." "We both grew up on the East Coast and most of our family and friends are there, so it was a very hard decision to move to the West Coast at such a pivotal juncture in our lives. Opportunity and the desire for an even more outdoor lifestyle ultimately were the main reasons for making such a big move. On one hand, we are so grateful that we did, but I would be lying if I said we also weren’t a bit heartbroken by it. It's bittersweet and that’s hard to get around." Dana wears an Ilana Kohn button-down and Citizens of Humanity jeans. Orion wears a Gap t-shirt and Milk Co. onesie. "The building is from the 1930s. 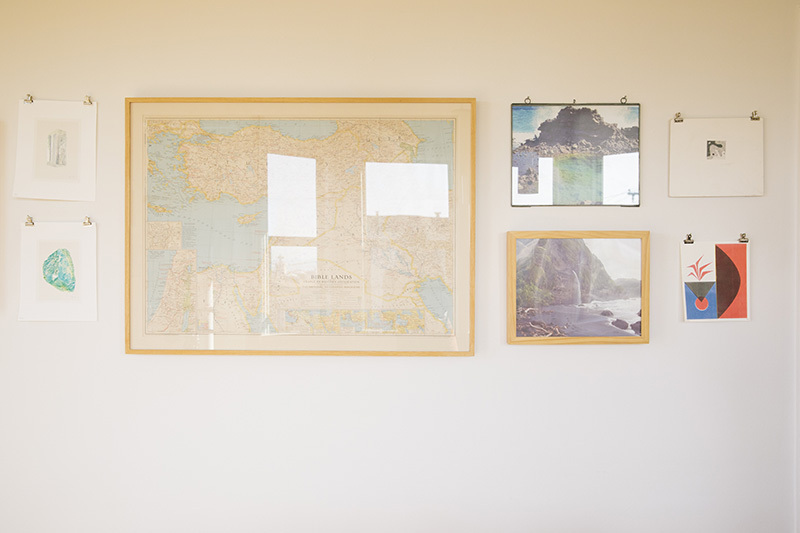 The apartment is drenched in light with sweeping views from every window, which is what made us fall in love with it, considering our last view was of a brick wall. It also has some authentic San Francisco art deco charm in its details. 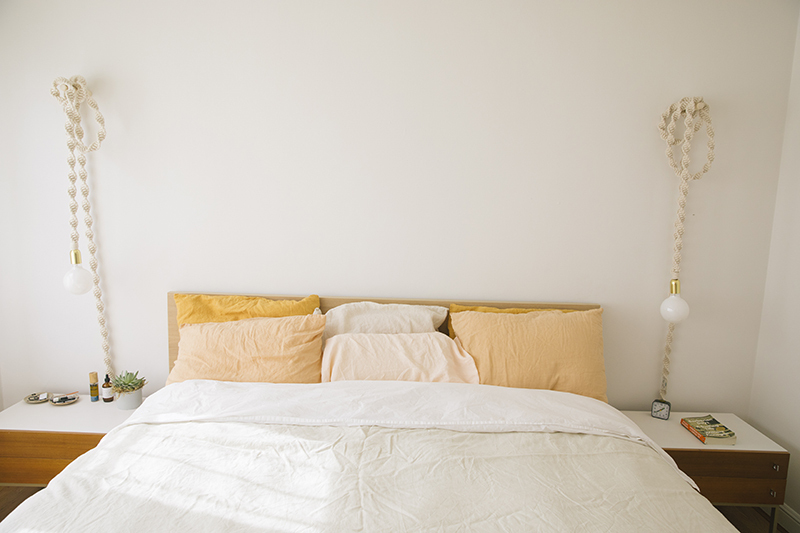 I am constantly moving things around and rearranging, but I like for it to feel not too fussy, not too messy, hopefully inspiring, cozy, and inviting." 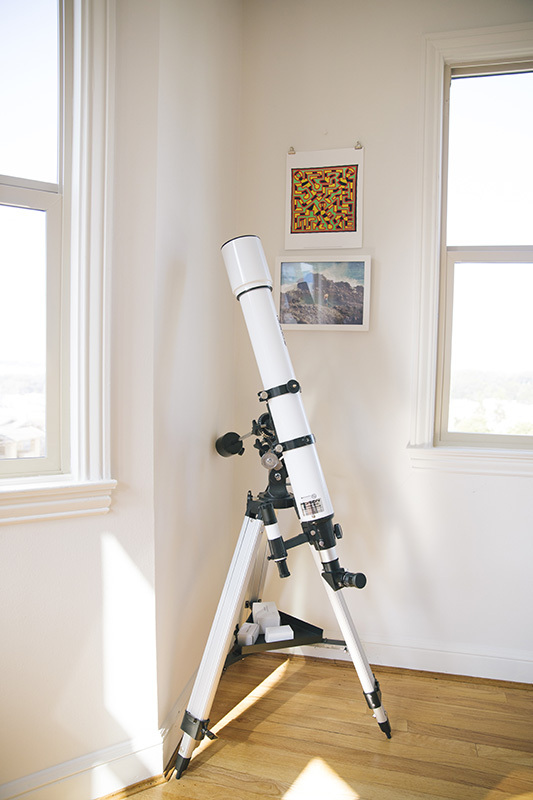 "I got my husband, Jaron, a telescope for his first Father’s Day and it's great fun for viewing all kinds of things. We often spot Red Tail Hawks, bluebirds, hummingbirds, and of course it's perfect for viewing Orion’s Belt." 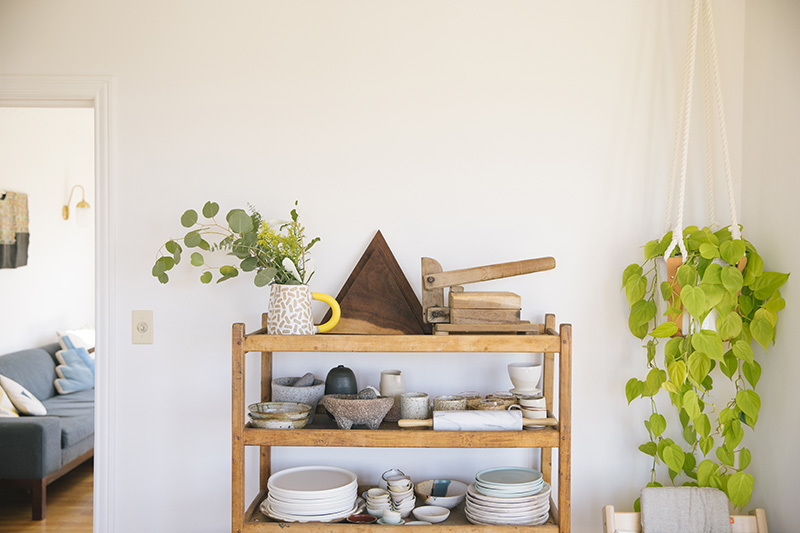 "I am fascinated by the Japanese concept of Wabi-Sabi and as I’ve moved from place to place over the years, I like to think that I’ve adopted some of the principles in my home and day-to-day thinking. Something about this worldview resonates with me and I think about it a lot in general, but especially when putting together my home. 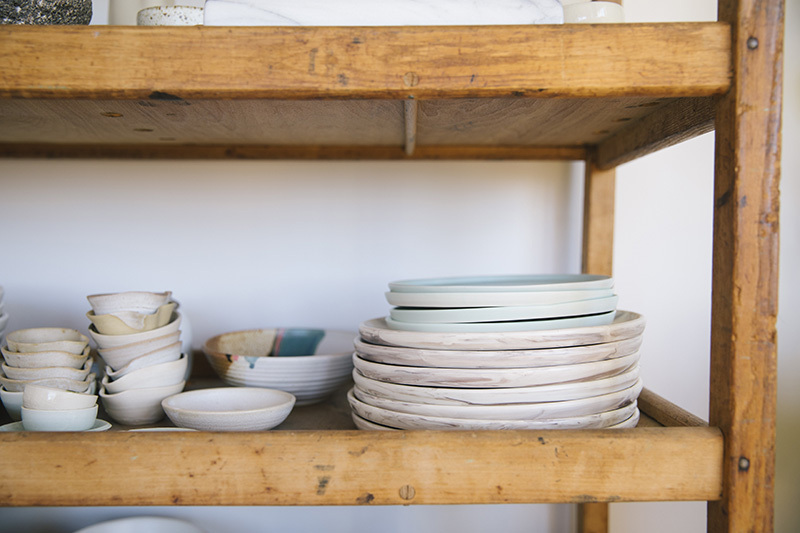 I am moved by the idea that everything is transient and that wear and tear and imperfection should be celebrated. I believe home should be a place to offer tranquility and reprieve from this chaotic world and I hope that our space does that for our family and visitors alike. I love to collect items made by friends or do trades with artists whose work I admire. It’s a work in progress and I am constantly saying 'We need to Kon-Mari again,' but it’s become more enjoyable for me to live intently and with less. Some of my favorite items are purely functional, but my moment of interaction with them everyday is satisfying and one that I look forward to, which renders them special to me. 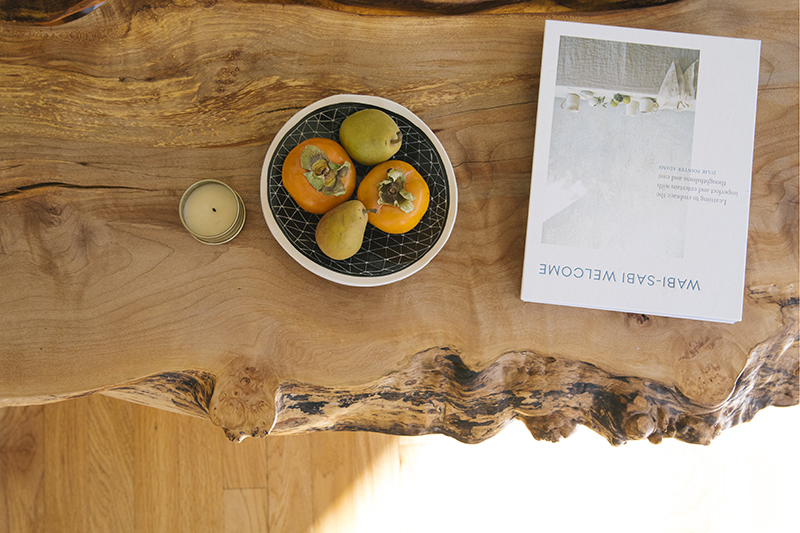 Ideally, nature should be brought into the home as much and as often as possible, so in our home you will often find natural light, lots of plants, our curtain-less windows open, porch door open, and all kinds of stones, driftwood, and other natural elements that we collect on our outings peppered throughout the space. 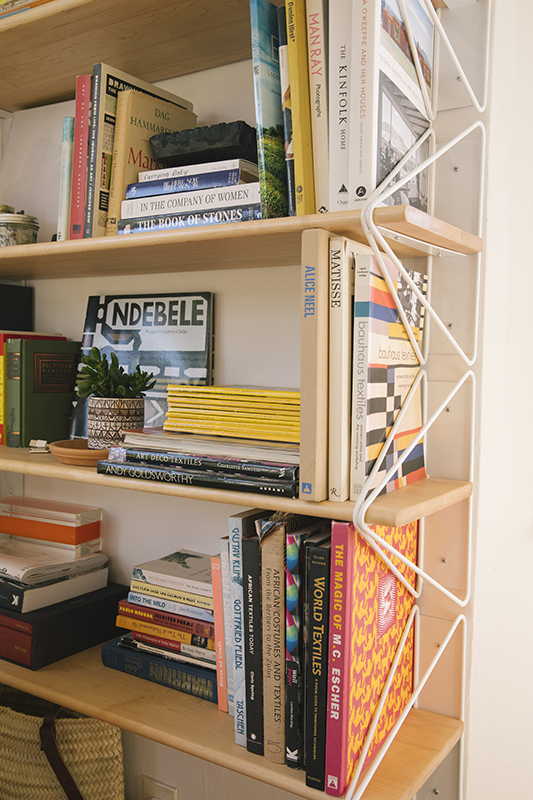 Lots of music, textiles, books, wood, ceramics, art objects, family photos, and heirlooms fill our home and hopefully one day more kids and a few pets. When people come over I love for them to feel welcome and at home, like they can just kick their shoes off, unbutton their top button, settle in and stay for hours. As a kid, I was always the last person to fall asleep at a sleepover, and I think part of the 'party scraper' has stayed with me. 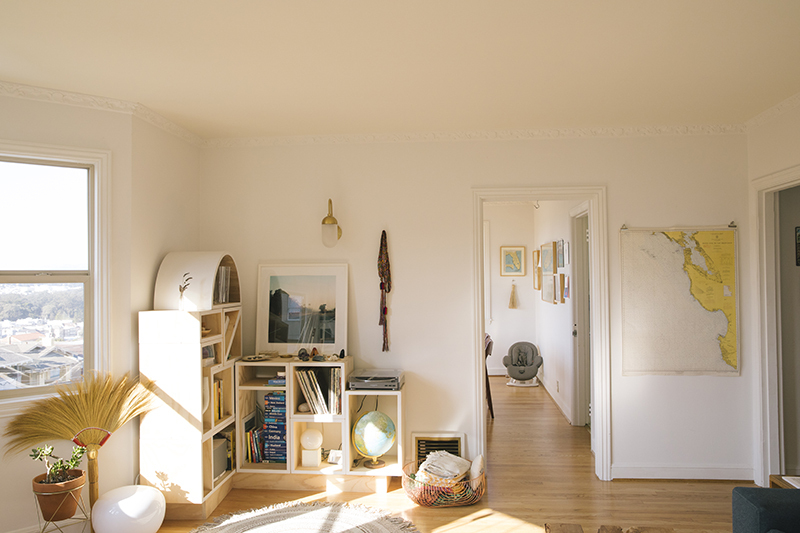 I love when people come over and really hang, so I try to create an environment that says that." 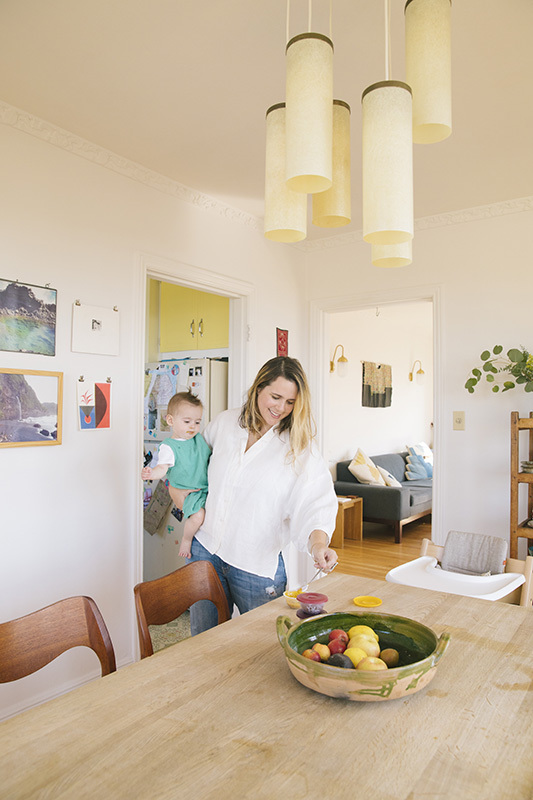 "These days I would say it’s between Orion's room, the dining room, and the kitchen." 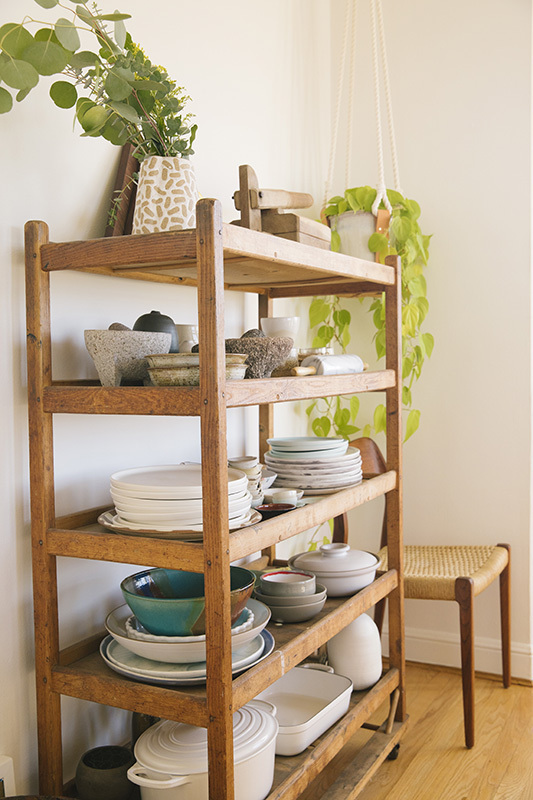 "Clearly, I have an affinity for handmade pottery and have developed a sweet little collection over the years, so I didn’t want it hidden away in the cabinets. We arrived in S.F. with just a dining table, so we needed to find chairs, a lighting solution, and a storage unit. We found this piece from the flea market, apparently it's from a shoe factory from the 1920s. 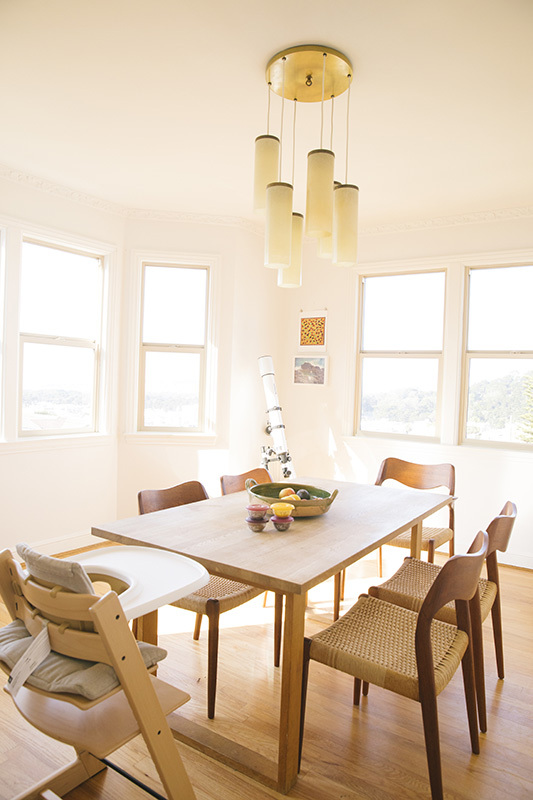 With some vintage chairs and a vintage light fixture, the room came together." 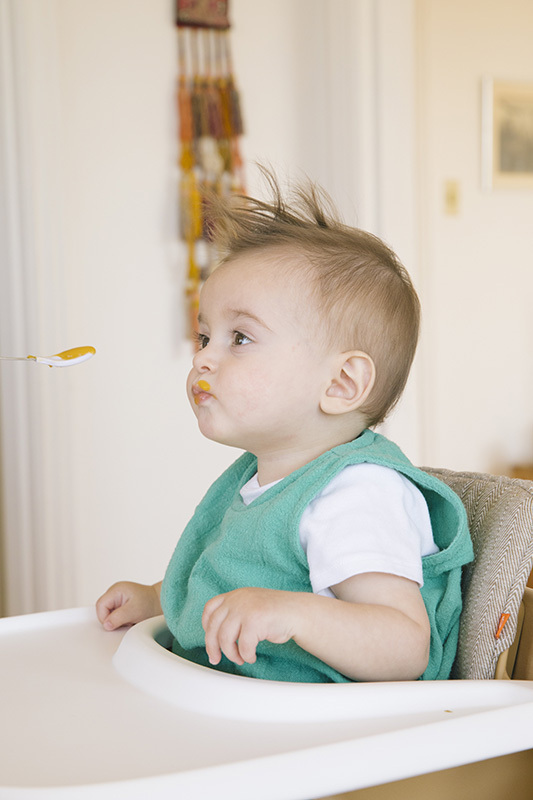 "It's really great to see Orion enjoying food with so much gusto. 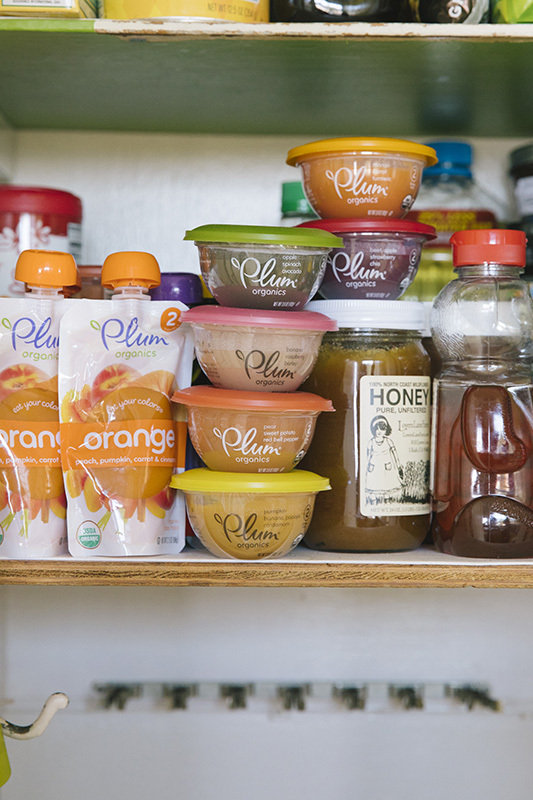 We travel a lot, and I've found that Plum Organics Bowls are great for when we are busy or on the move. Orion loves them, especially the Mango and Cardamom Baby Bowl. It’s very cute to watch him savor it all up." Plum Organics' brand new Baby Bowls product comes in 10 delicious flavors—Mango & Quinoa; Pear, Sweet Potato, & Red Bell Pepper; Pumpkin, Banana, Papaya, & Cardamom; Beet, Apple, Strawberry, & Chia; Pear & Prune; Apple, Spinach, & Avocado; Banana, Raspberry, & Barley; Apple, Blackberry, & Oat; Mango, Carrot, & Turmeric; and Pear, Cauliflower, Cherry, & Raisin. Read more about the innovative Bowls, and add these 5 mommy-and-me meal recipes (inspired by the Bowls) to your weekly rotation. "Life is just sweeter with him in it. Everything's more fun and feels like a wild ride now that he is part of us. Every day we are learning new things about his personality and we are in awe of how incredible it is to watch it unfold little by little every day. It’s a treat to be able to watch it develop. He has one of those infectious and contagious laughs that was such a great surprise to discover. Seeing the world through his eyes and experiencing everything for the first time is adding a new dimension to life that I was completely oblivious to before. I had heard people talk about it, and now that I am experiencing it, I totally get it. We have fallen madly in love with this little person." "I am just trying to stay as present as I can with him and really take things one day at a time, one moment at a time. I was so scared of pregnancy and birthing, but I got through that (a 48-hour labor, nonetheless) and I came out on the other side feeling more confident and strong. So, I believe the lesson there is to not worry so much about things in the future that I cannot control, but rather to just dive in, do my very best, and have faith that things will work out as they should." "His name is Orion Isaac. Orion comes from that familiar constellation in the night sky that is seen all over the world, tied to legend in just about every culture. The word itself is from Greek mythology, it is mentioned in the bible three times, and believed to be linked to the orientation of the pyramids in Egypt. Orion’s Belt is at the local meridian in late January in the Northern hemisphere around 10pm at night, precisely at the time of our son’s birth. We like to call him Ori (which means ‘my light’ in Hebrew) as a nickname. I had a very long and exhausting birth, which forced me into an epic voyage into the deepest parts of my inner world. 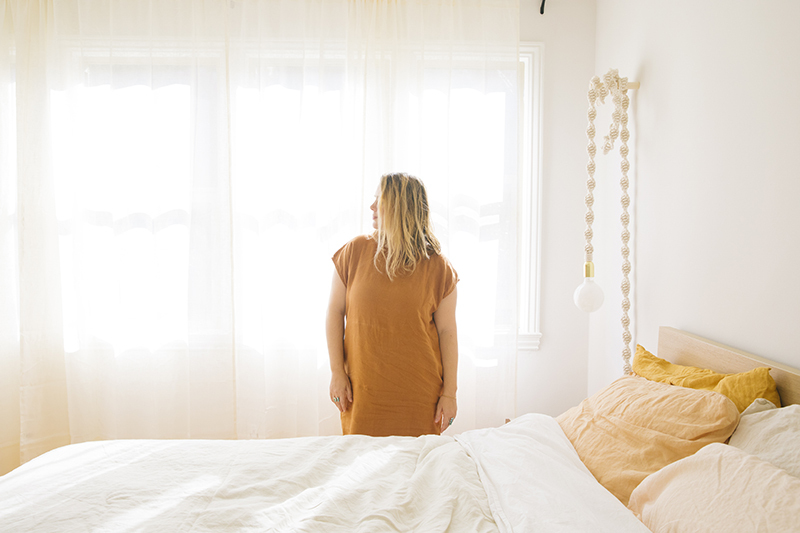 When I was in the birthing tub in a very meditative and spiritual place with Jaron and my doula, I started seeing stars and feeling an out-of-body experience very much in tune with the cosmos. I felt like I was floating in space and observing my birth from above. When I came to, I kept saying I wanted to name him starlight. After the odyssey that was the birth, I made some notes on my phone that night so I wouldn’t forget those feelings. The theme of stars kept coming up, so we knew we wanted something along those lines. His middle name, Isaac, comes from Jaron’s grandfather and my father’s middle name, so we wanted to honor them and his Jewish heritage with Isaac." 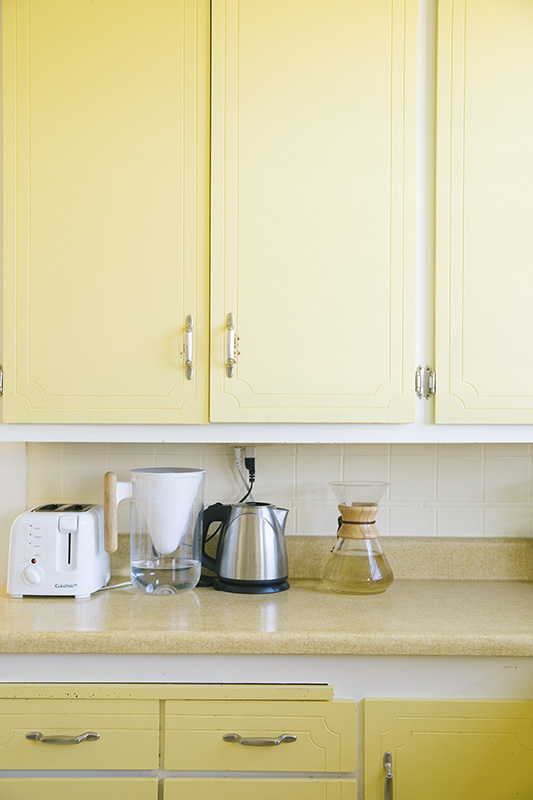 Although Dana and her husband painted the entire apartment white when they moved in, they decided to keep this sunshine yellow happening in the kitchen. "I was born and raised in Miami, the third child of three sisters. My parents emigrated from Bogota, Colombia just before I was born, so we grew up in a Spanish-speaking, Latin, Jewish household. 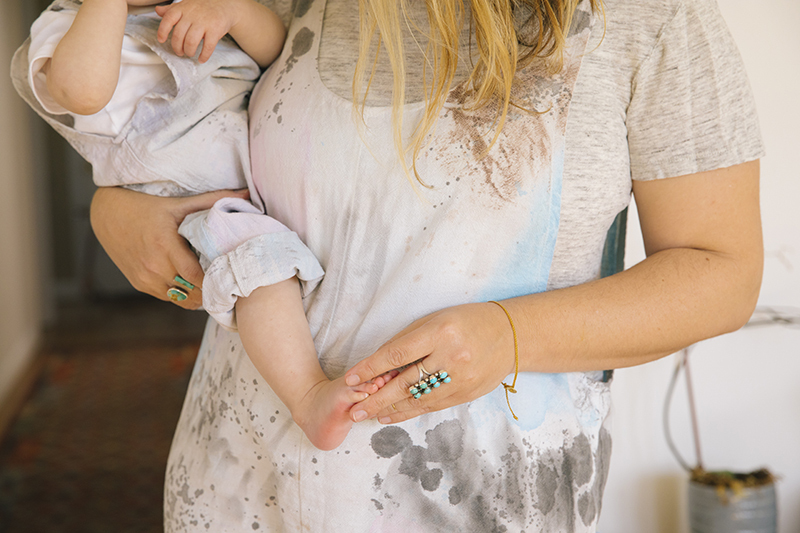 My mother is an artist and interior designer, so we had a great role model of a full-time working mama who was so present and there for us at the drop of a hat. My father is a businessman and entrepreneur who has multiple businesses, including precious stones, jewelry, and real estate. Both my parents are hardworking, dedicated people who set a great example for us for what a great work ethic and great family life look like. My sisters and I are extremely close even though there are many years between us. We grew up as best friends and have remained best friends. They are also very creative, Monica is a fantastic writer, filmmaker, content creator, and so much more, and Michelle is a talented interior designer who is now at the helm of our mother’s firm. Needless to say, the creativity in our family flows like hot lava. Laughter and entertainment were a constant in our home. We spent a lot of time outside in the tropics either on the boat or at the beach and got a lot of exposure to nature through our dad who is the epitome of outdoorsy." "I think a lot of our core values are the same, but the day-to-day is a bit different based on very different sets of circumstances we were all raised in. I hope to be as generous and gracious to Ori as my parents were and are for us. They definitely set the bar very high." 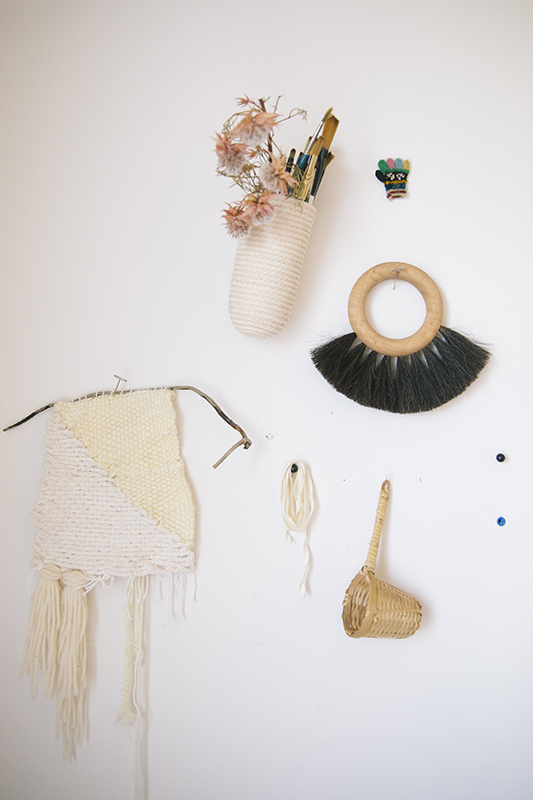 "I started out with few items, but each one held some significance to us. Those items dictated the direction for the rest of space. We did not know if we were having a boy or girl, so I went for something gender neutral, though, to be honest, I probably would have ended up with the same room for a girl. I just wanted it to be cute, cozy, and simple. Now that he is getting bigger, I want it to be a fun and free space for him to explore and enjoy. We are constantly moving things around to adapt to his needs as we learn what those are." 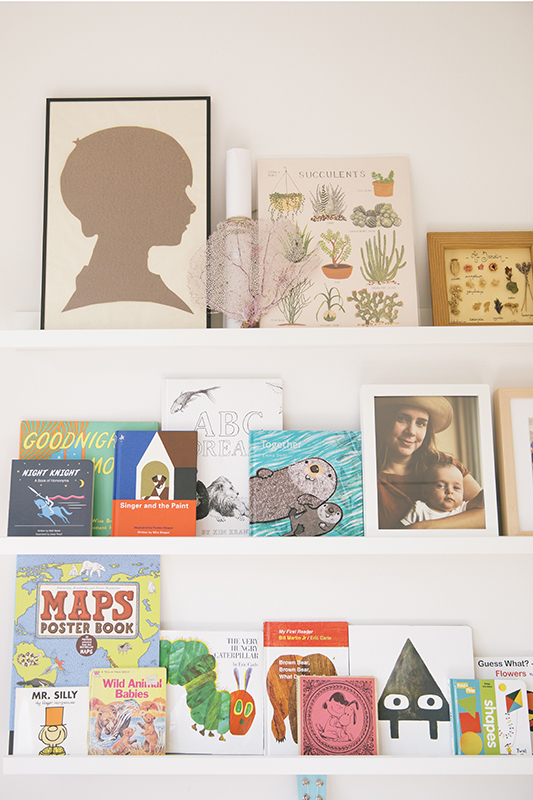 We spy some of our favorite books, including Night Knight, Goodnight Moon, Singer and The Paint, ABC Dream, Together, Mr. Silly, MAPS Poster Book, Wild Animal Babies, The Very Hungry Caterpillar, Brown Bear, Brown Bear, What Do You See?, Triangle, and Guess What? Flowers. 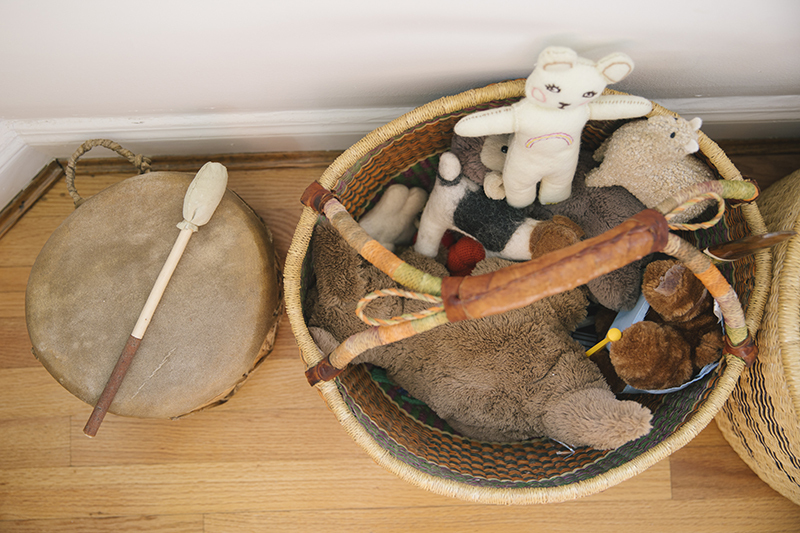 "Orion’s room is really his zone and most of the stuff stays in there, however we have a few small baskets with some toys and books for him in our room and the living room, so that we have something for him at arm's reach at any given moment. I am not overly zealous about everything needing to stay in his room either; I enjoy seeing his little toys and things sprinkled around the house as reminders of him. They make me smile." 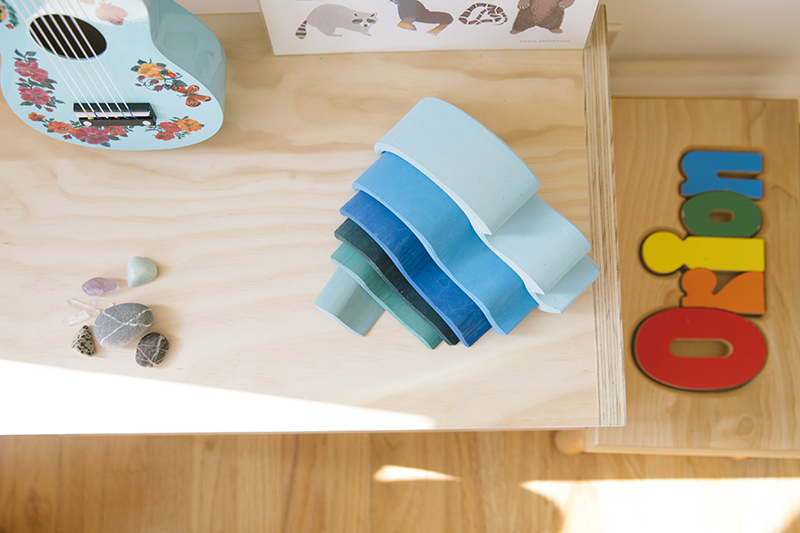 A tiny rock collection, Grimm's coveted Wave Stacker, and Orion's personalized stool. 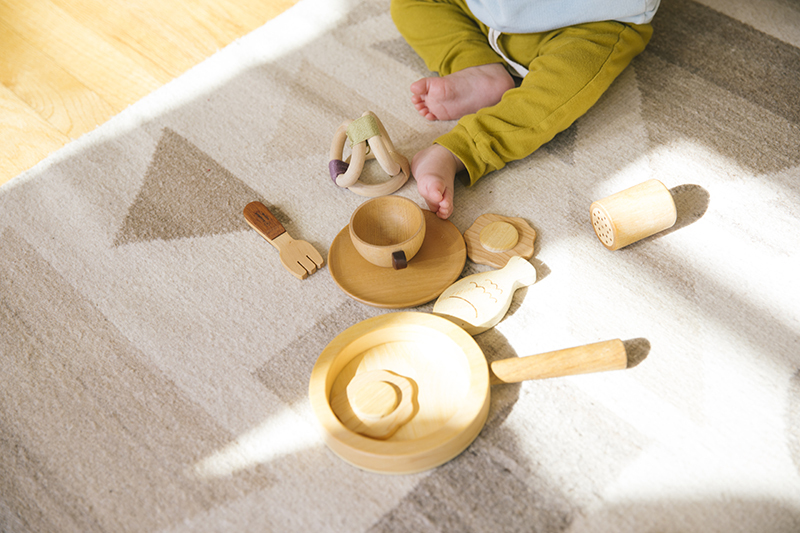 Wooden toys atop a Dana Haim Teoti rug. "I love the silhouette of Jaron as a 6 year old. The sheepskin that I got from my friend Rachel Greville is really beautiful and wild. She sources them from one of my favorite places on the planet, the San Juan Islands, where I spent a summer teaching at an art camp. I am also very pleased with the Teoti rug from my textile home collection that I tweaked a bit to fit the space. 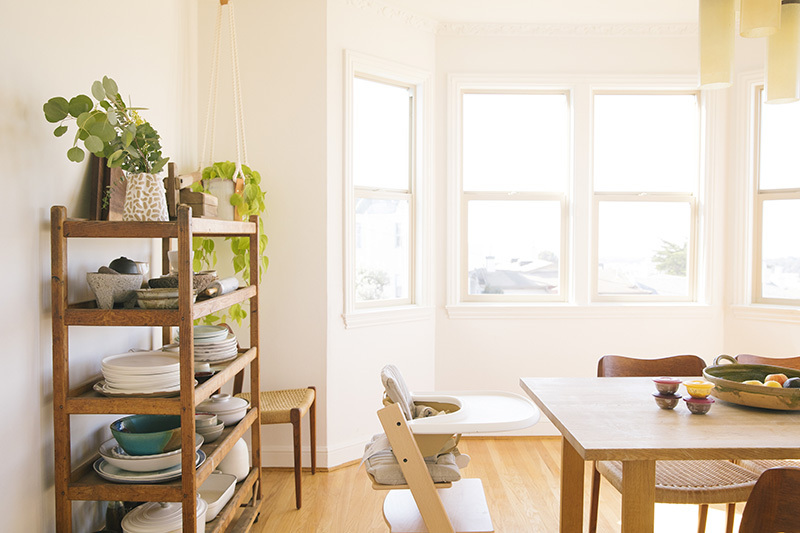 The rocking chair is a vintage Danish mid-century piece that was the first piece of furniture we got for the apartment at the Alameda Flea market and it’s so comfortable. 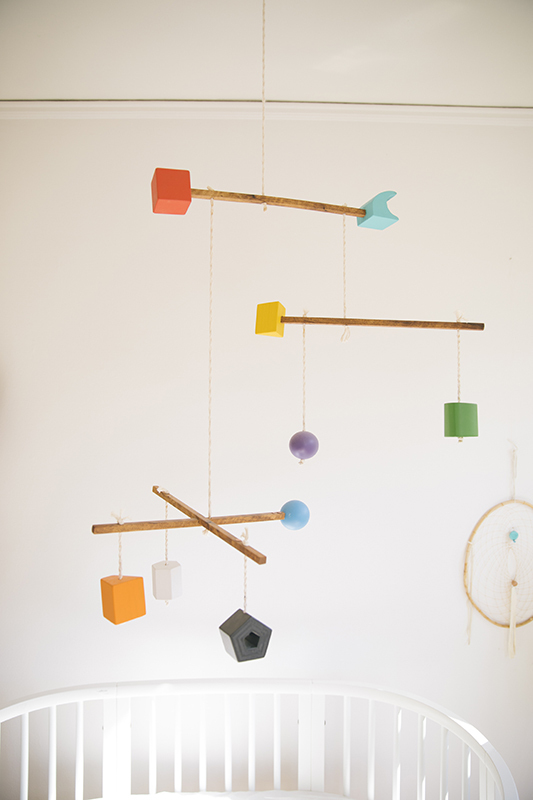 Orion's Bauhaus-inspired mobile is very special to me, as it was handmade by my friend Jonathan Anzalone who is a talented local artist and wood worker. He designed it especially for Ori and it's really beautiful and mesmerizing to watch in motion. 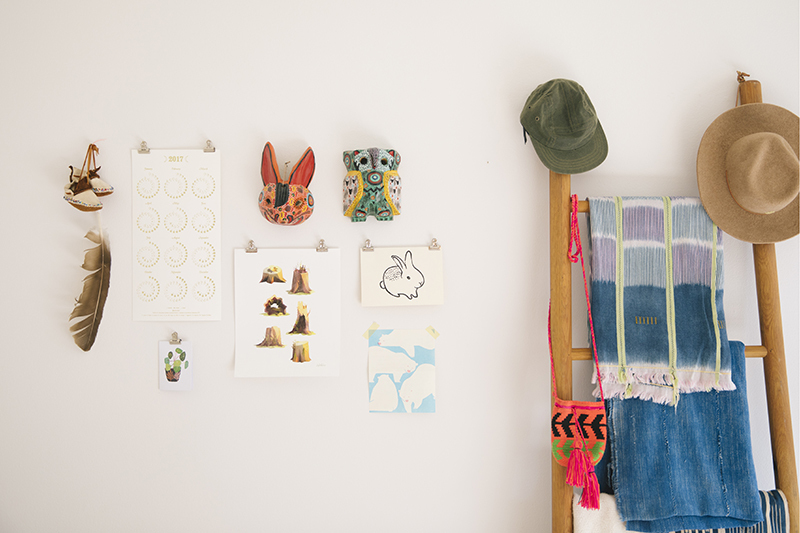 I also love how the pom-pom wall I made for him turned out." 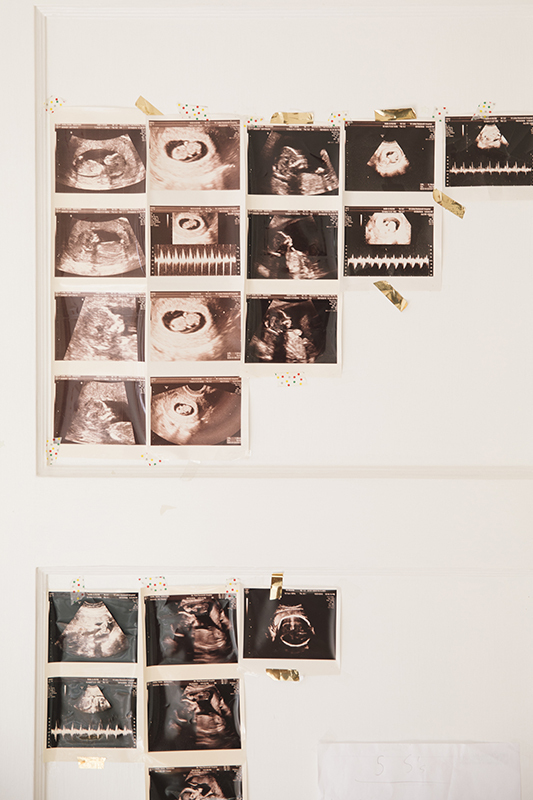 "I did not know or care if I was having a boy or a girl. I just wanted a happy healthy baby, and that’s what I got. I am extremely excited to raise a boy because I grew up in a house of all girls, so this is new territory for me." Dana wears an Ilana Kohn jumpsuit. 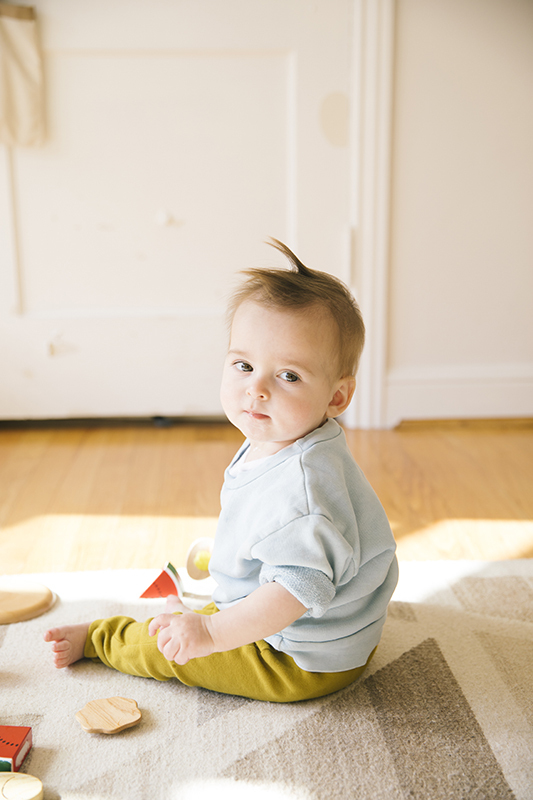 Orion wears a Rudy Jude sweater and Mabo pants. "I have a tremendous amount of admiration and respect for the women in my life. My mother, mother-in-law, grandmothers, sisters, aunts, sister-in-law, and friends are some of the most patient and loving women and mothers I have met. Most of my friends are parenting all their kids so intently and gracefully that it's been really nice to observe and look up to now that I am on my own path. I am grateful to have been surrounded by so many incredible women in my life to show me the way. 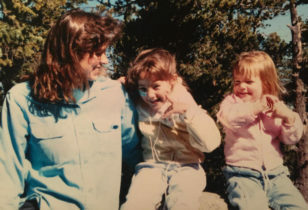 I also have great admiration for many of the entrepreneurial or creative moms, like my own, that have shown me that it is possible to be a mother and have a great career. I was so scared when I became pregnant about losing that part of myself, but I know now that it is possible. Not easy, but possible." 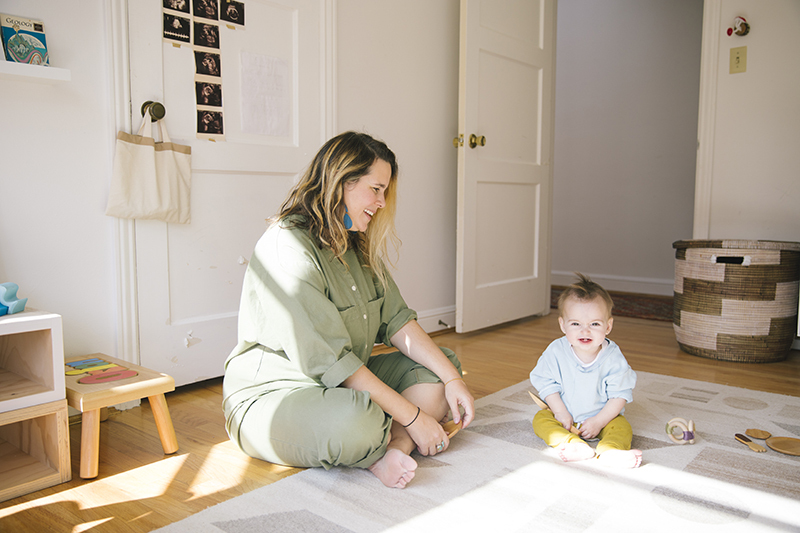 "I found out I was pregnant just after I launched my collection in New York at Sight Unseen Offsite. We were pleasantly surprised and very excited. I had a pretty great pregnancy despite some morning sickness, moving cross country, and traveling a lot throughout the pregnancy. My birth was a 48-hour marathon. It was very intense and most of it was at home and not medicated. Around hour 42 I was physically drained and extremely exhausted, I hadn’t slept in 2.5 nights and just couldn’t go on anymore. My contractions were 25+ minutes long, which my doula (who had just clocked her 200th birth) had never seen before. I felt that I could have gone all the way not medicated, but I plateaued for a long time and just stopped dilating. At that point I happily asked for the epidural and probably made Jaron jealous with the way I looked at that anesthesiologist after he gave it to me. I have never been more grateful to someone in my life. Orion came out two hours later with fairly easy pushing. It was the most incredible moment of my life." 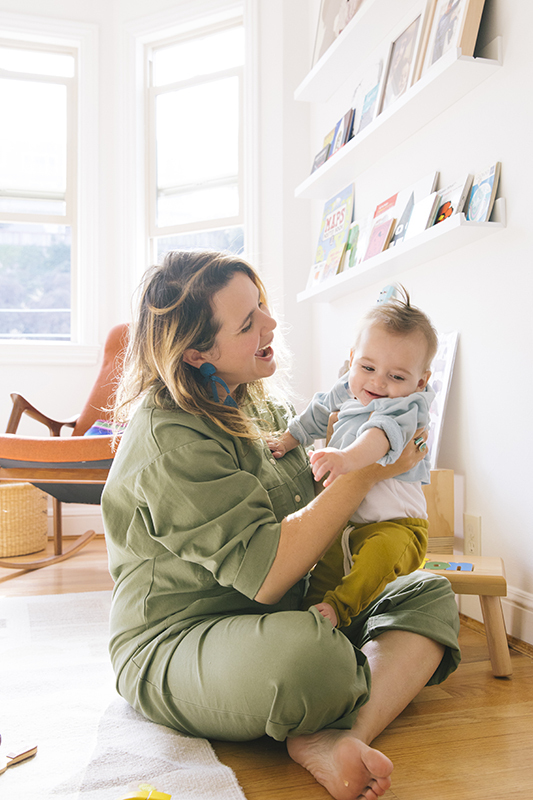 "I read Ina May Gaskin’s Guide to Childbirth, and though I did not have a home birth, I took many of her principles to heart and felt very positive about the birth we had, thanks to many of the ideas she talks about. We also watched a bunch of YouTube videos from the farm and her TED Talk, and those helped us prepare for the birth, as well. I constantly refer to KellyMom for breastfeeding info. 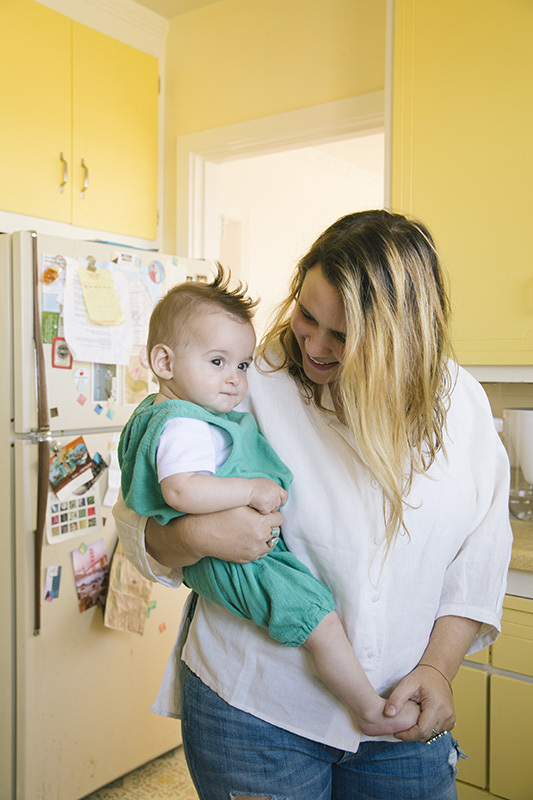 Having a great doula and a lactation consultant really helped us, too." Textures, color, and personality everywhere. 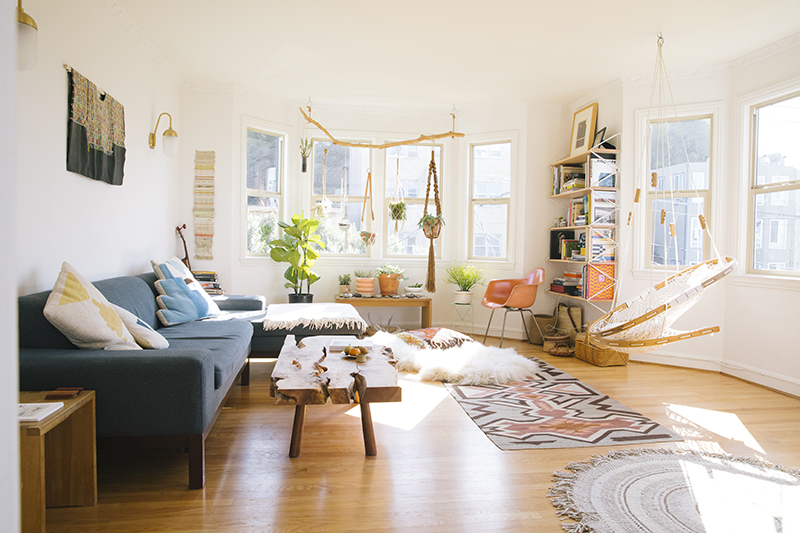 The beautiful living room, complete with a swing. Dana and Orion wear matching State the Label jumpsuits. "First and foremost, trust your gut. There is so much advice that’s thrown around to women and couples having their first child. I remember being overwhelmed by all that noise and at a certain point just deciding to let that advice flow through me and just grab at the things that resonated, while dropping most of the rest. I sifted through that noise and what I ended up using were the classic pearls of wisdom, like take the help from anyone who offers, sleep when the baby sleeps, etc. But I ended up going with my gut for most of the process and going with the flow and luckily, things turned out alright. Don’t be afraid of your own voice and ideas. 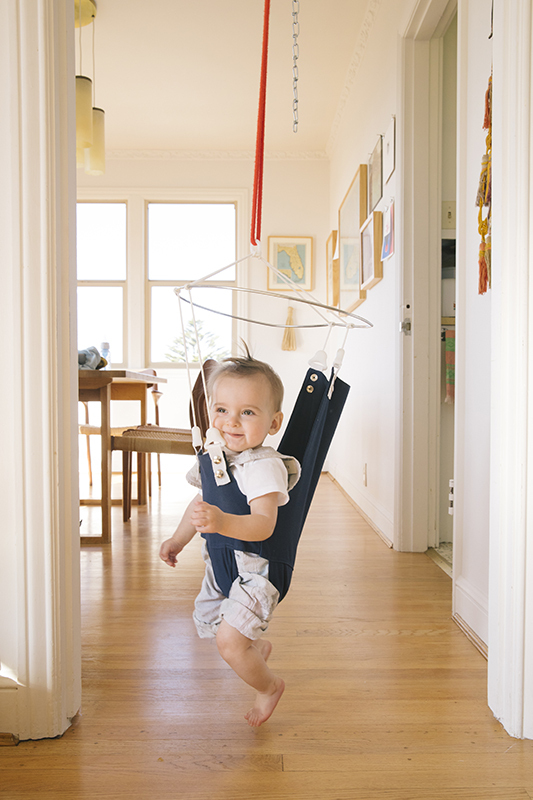 You and your partner ultimately will know what is best for your baby." "It's not easy and I do the best that I can every day. I try to not overwork or overwhelm myself, at least right now in his first year, because I am mostly taking care of him full time with not much help. The little time I have left I try and use to make a plan of action for next year. We recently had our first date night and first 24-hours away from Ori, which was a big milestone for us that I am looking forward to doing more of." "We spend so much more time outside, which we all love. We get to enjoy the perks of living in a cosmopolitan city while having incredible access to natural resources and country at our doorstep, and we really try to take advantage of that as often as we can. I have also met some really lovely women and mothers here that have made the whole process of living in a new city with a newborn a lot less scary. I did not know many people when I first got here and I feel fortunate to have been able to tap into a local creative community. I love raising him in such a diverse, progressive, and historic place with so much natural beauty." "It's hard to say right now because we just got here, but we are open. Jaron and I both grew up in Miami and actually re-met while we were both living in Tel-Aviv. I have also lived in London, New York, Providence, Miami, and Cartagena. He has lived all over the world and travelled a lot as a journalist. We both love the idea of living in different places and exposing Orion to new cultures, languages, and experiences. I think it's actually crucial for him to be aware of life outside of our bubble and I believe it will make him a more compassionate and well-rounded individual to experience the world outside his comfort zone." "It's definitely much smaller than what I have on the East coast, which honestly, is challenging. Having said that, I do have some close friends and some family that live here, so we have made more of an effort to nurture those relationships as well as to foster new ones." "We end up at Golden Gate Park a lot. We are grateful to live so close to such a grand, sprawling park. I walk through the Botanical Garden regularly and will post up with the baby and play with him there in the grass for hours. The California Academy of Sciences and the de Young museum are also amazing and so close! 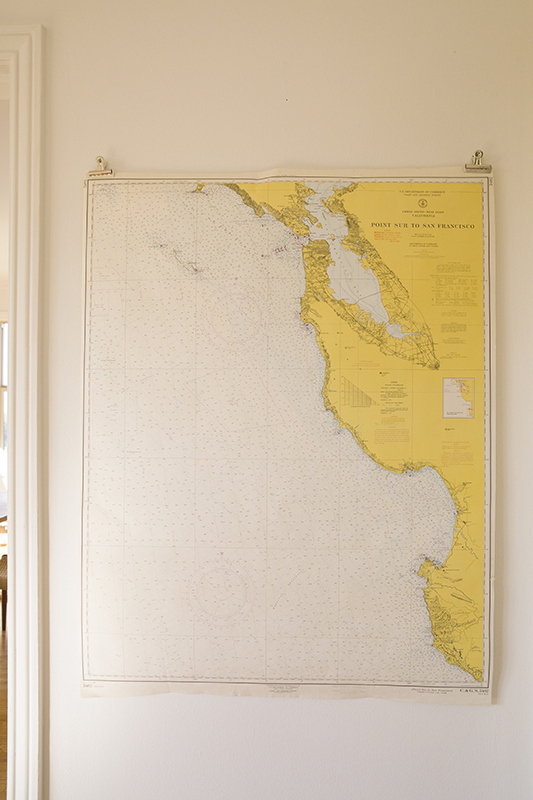 We take lots of trips out to the Yuba River, Bolinas, Inverness, and Point Lobos. We love getting flowers, special groceries, ice cream, and sandwiches at Bi-Rite, pizza or spaghetti at Delfina, pastries at Tartine, having breakfast at Outerlands, Plow, and 20th Century Café. Our neighborhood has really amazing Asian food, we particularly love Yummy Yummy for Vietnamese and Ebisu for exquisite sushi. The Farmers Market on 9th Avenue is so close and we walk there whenever we can. We also spend a lot of time in the Outer Sunset. We always stop into General Store, Trouble Coffee, and now Blackbird Books on our way to Ocean Beach. Case for Making is my go-to for art supplies. Alexis, the owner, is the nicest person and has such a great eye for special materials. We recently did the Lands End hike for the first time and it blew our minds with how breathtakingly beautiful it is. It's amazing how many incredible hikes there are to do right here in the city." 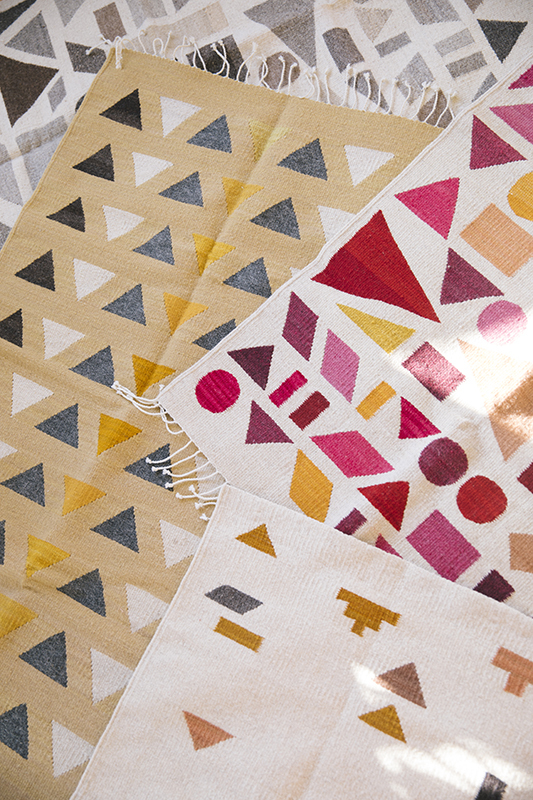 "I am an artist and textile designer with a business dedicated to thoughtfully made heirloom products for the home. 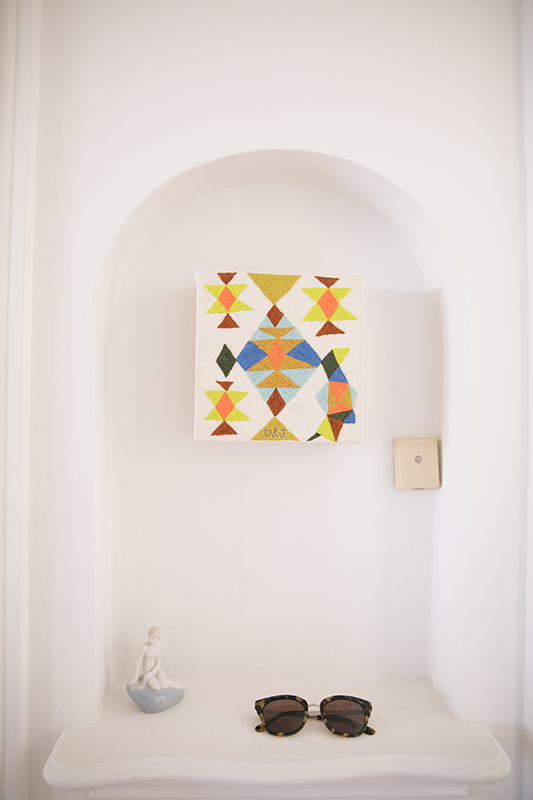 I also make site-specific textile art." 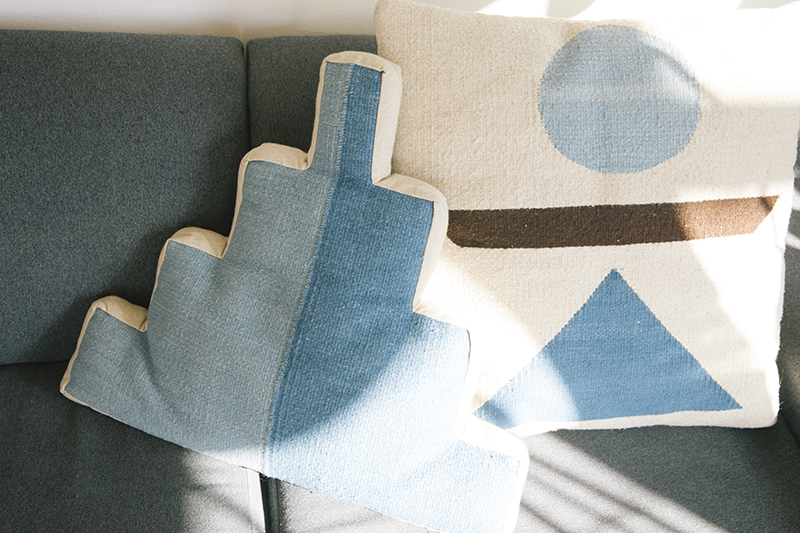 Two of Dana's pillow designs. "Orion is my biggest inspiration. Since he was born, I feel a fire ignited inside of me to be the best version of myself that I can be for him every day. It’s a work in progress, but I am trying my hardest. 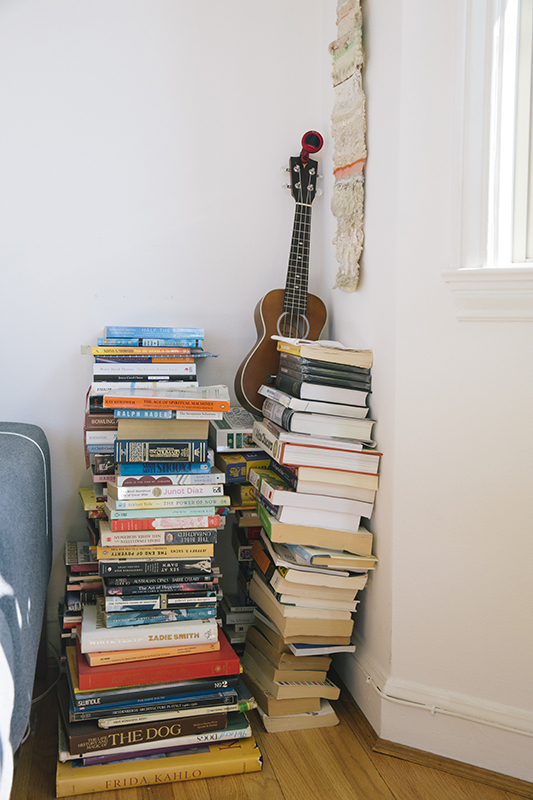 Our apartment and life in California have been a huge source of inspiration, too. The magical quality of the light and the expression in those dark cypress trees take my breath away. The way the fog rolls in like a cozy blanket over the city is emotional and moody. I love the turquoise, emerald colors of the Yuba River speckled with glimmers of gold and the rounded shapes of the boulders there. The lavender urchin and glowing anemones in the tidepools have incredible iridescence. The hairy pampas grasses are everywhere and look like clusters of mohair. The succulents drip and the ocean is this ever present force that is so blue, calming yet powerful, and simply gorgeous. The nature here drives me wild. Getting this much time outside feels so right and makes me want to get out there more and draw and paint more." 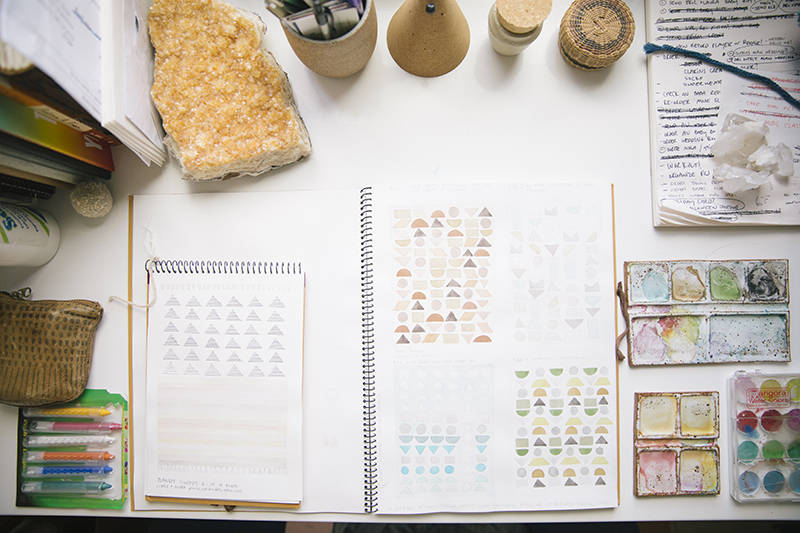 "I went to college at the Rhode Island School of Design with a focus in textile design. I spent some time working for artist Jim Drain who was incredibly inspiring and taught me a lot about craft, patience, and materiality. I traveled a lot after college, and in that time I spent 6 years on and off living in Tel-Aviv, working for a design studio and Israeli artist Galya Rosenfeld, when I re-met Jaron, who is also from Miami and was living there working as a journalist. Later, I went on to get a Masters at Central Saint Martins, where I got an MA in design for textile futures. 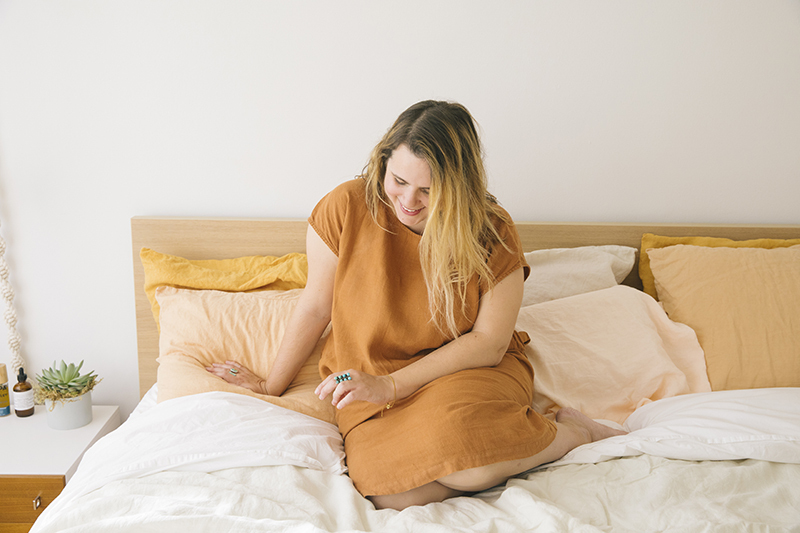 After I graduated, I then reconnected with Jaron and together we moved to New York where he launched a freelance video production platform, called Storyhunter, and I launched my textile business." "It has in the sense that I need to be much more deliberate and selective with what I do day to day. Having him forces me to be much more resourceful and economic with my time. It has also taught me to slow down and be much more present in my actions. Right now that's very much applicable to him, but eventually I hope that this presence applies to moves I make with my business and art, as well." 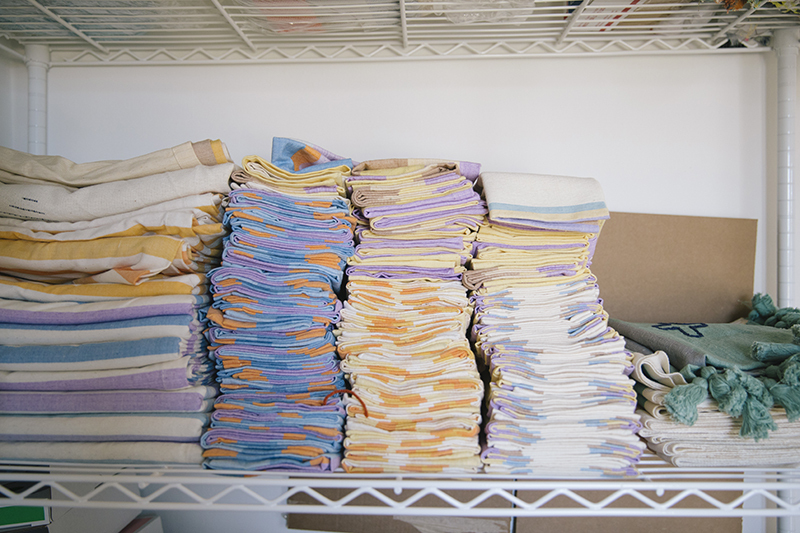 Stacks of Dana Haim tablecloths and napkins. 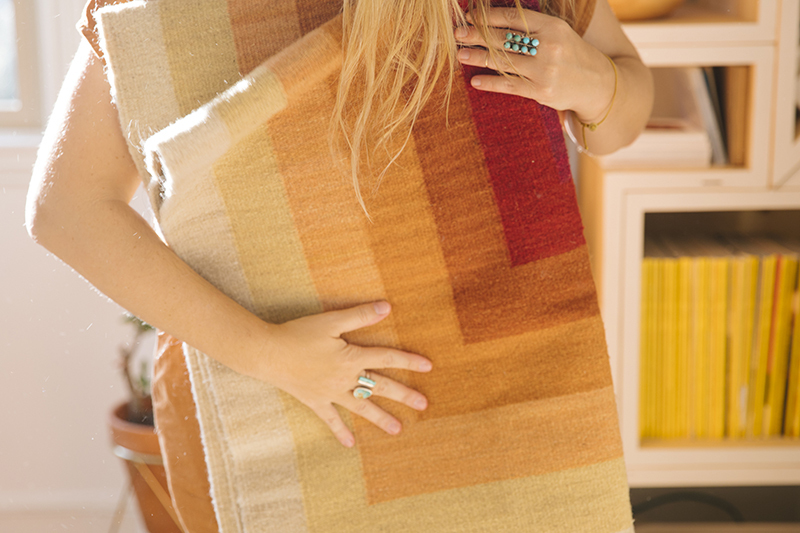 "I currently work with artisans in Oaxaca and Guatemala to produce my line of textiles and strive to grow my roster of artisans as the business grows. 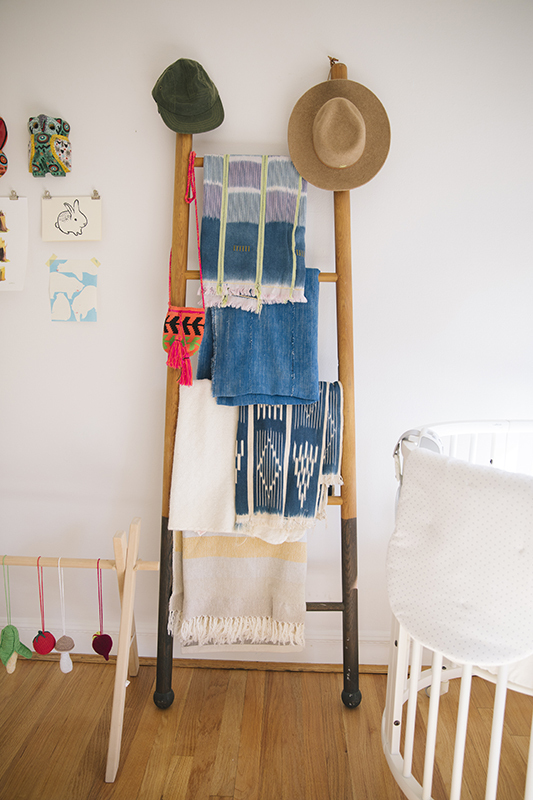 I am proud to work with small families who work with all natural materials and natural dyes. I am proud to work with an all female co-op in Guatemala. These are all small steps, but I hope to use this work to make a positive impact on our world and my whole reason for doing so is Orion. I want to teach him about helping people, working ethically, and leaving the planet in a better condition than we found it. I also want to set a good example for him in showing him what it looks like to work hard on something you believe in." 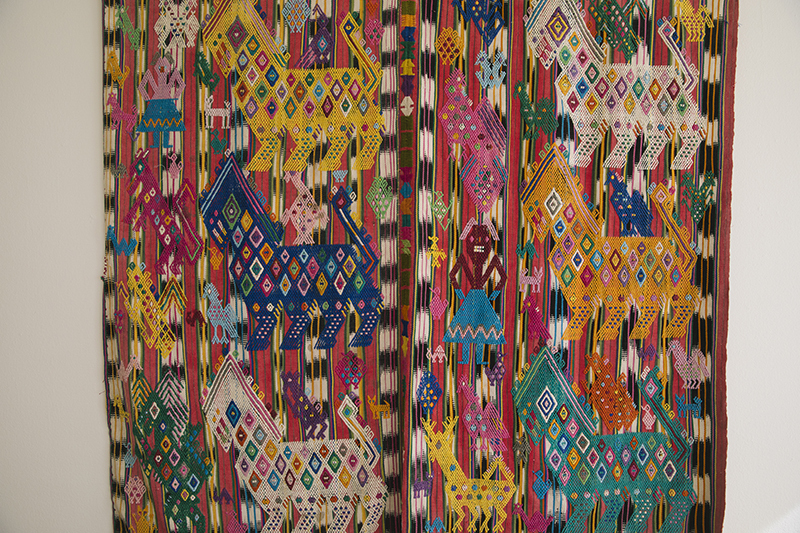 Layers of Dana Haim rugs. "I hope so, but ask me in a few years." "Lists! I make lots of comprehensive, multi-tiered lists all the time, and not just in my phone, I love a hand written list that I can physically cross tasks off of with a good pen. I make them annually, monthly, weekly, daily. This helps me get everything out of my head to better map out and distribute the stress." 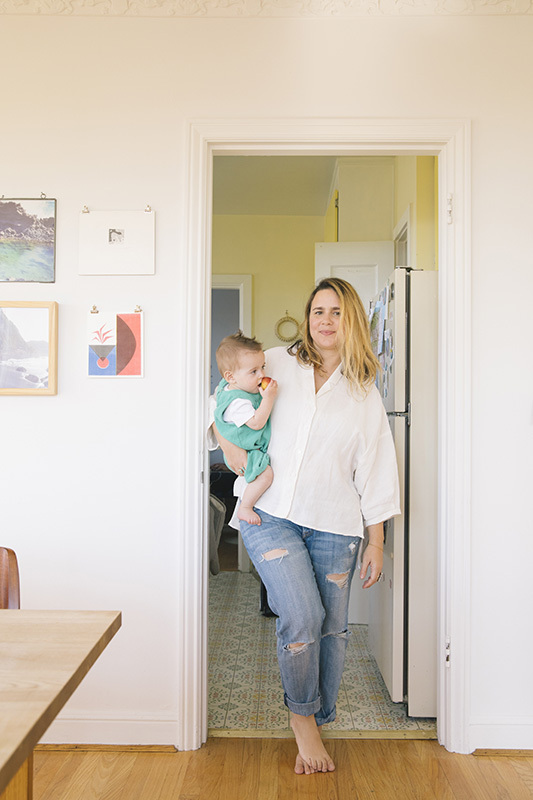 "When you have your own business there is no real maternity leave." "I am still fine-tuning my plan for 2018, as I am still taking things one day at a time with Orion. Now that he is starting to be in more of a routine and I understand motherhood a bit more, the fog is starting to lift and I can see a bit where things are headed. I am looking to hire someone for my team, which is a big step. I would really like to grow the business and am already developing the next collection." Dana wears a Black Crane dress. 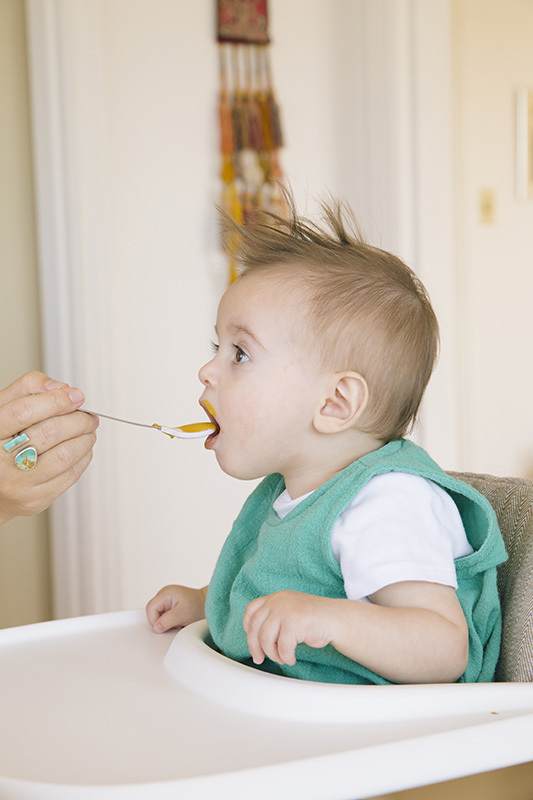 "It hasn’t changed much other than having to adapt to breastfeeding a bit. Lots more loose and flowy button-down blouses. I love comfortable and simple pieces with a modern edge. 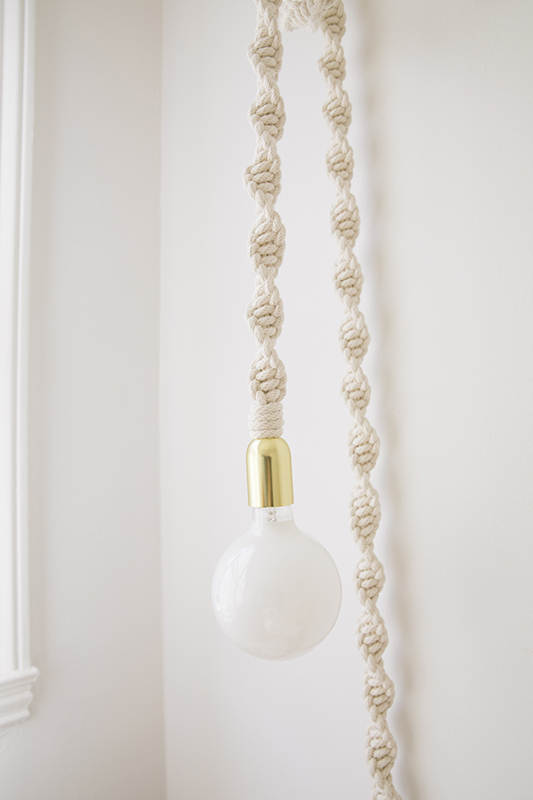 I like to mix old and new and find special vintage pieces to mix in." "Vintage denim, vintage textiles, a good hat—especially in California—old t-shirts, vintage sweatshirts, my MNZ shoes, No. 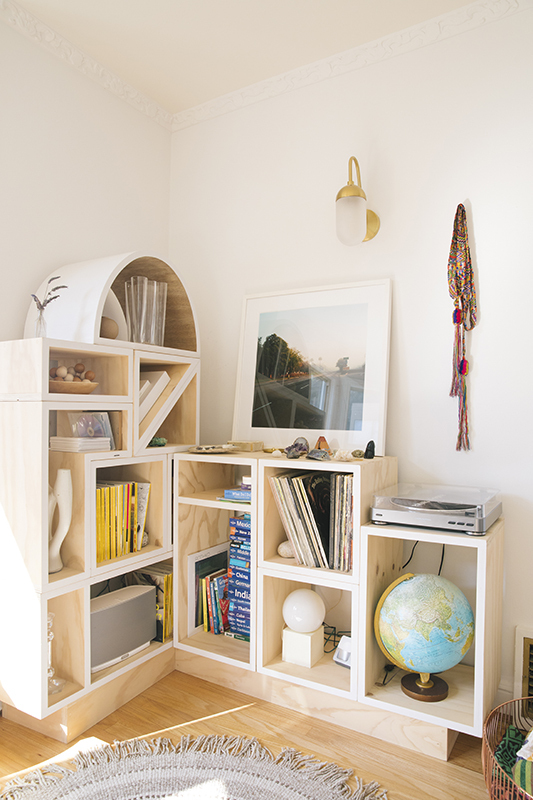 6 clogs, and a variety of neutral and white pieces to mix and match with. I love a good jumpsuit, too." 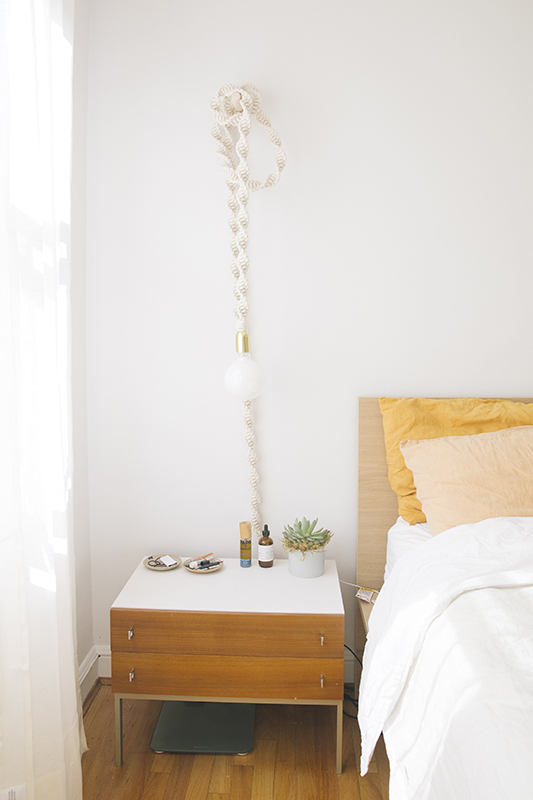 "I love Ilana Kohn and Jesse Kamm for easy, comfy, chic timelessness. Shoes by No.6, Maryam Nassir Zadeh, Loeffler Randall, and A Détacher, Rachel Comey has unique textiles incorporated into her pieces and very interesting silhouettes. I love Milena Silvano, her shearling coats are at the top of my wishlist. I admire Jacquemus’s progressive and artistic perspective, Celine’s sleek and modern sophistication, Black Crane has the loveliest fabrics, Babaà knitwear for sweaters, Building Block, Crescioni, and Jujumade accessories steal my heart. Mansur Gavriel has a great sense of color and minimalism that I find very inspiring." 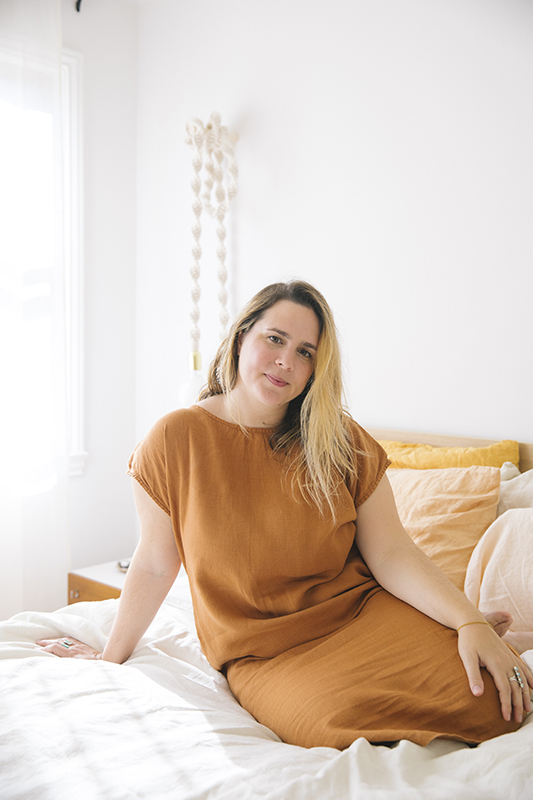 "My beauty routine is pared down now, as I have little time for self-care, which is something I am actively working on. I exfoliate two or three times a week with Aesop Exfoliating Paste. I also use Aesop's clay mask twice a month. Everyday Oil is such a fantastic product that feels like a one-stop shop for wellness. I slather myself in that after a bath and it feels like I went to the spa. I like the Cosmos rose and lavender face oil and together with the Everyday Oil it really feels luxurious and smells like heaven. A dab of Fat and The Moon cheek and lip stain and Dr Hauschka mascara to dress up. Earth Tu Face lip and body balm daily." "I take super long walks with Orion and love hiking as much as possible." "Unfortunately, there is not much of that these days, but the few moments I do get I use to take a hot bath and/or watch 'Broad City' or 'Chef’s Table.'" For more on Dana, visit her site and follow her Instagram feed. 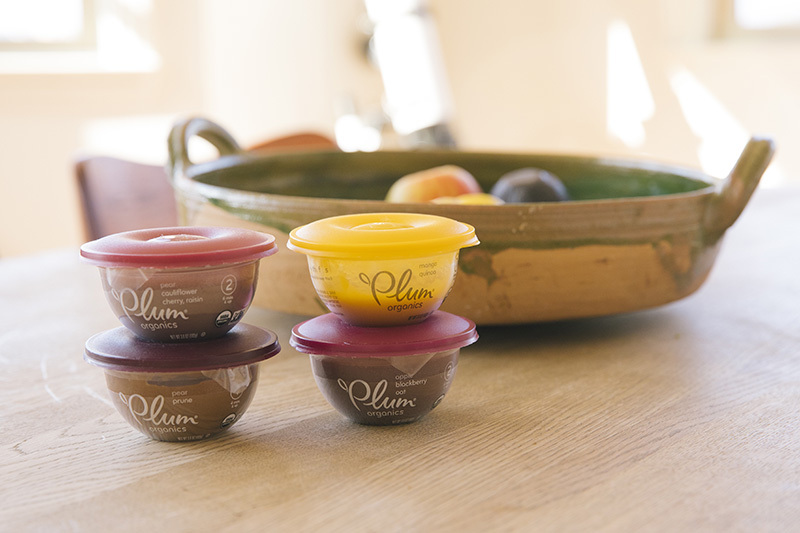 For more on the Baby Bowls seen in this story, visit Plum Organics®.